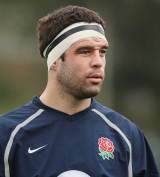 Worsley joined Wasps at the age of 16 and soon became the youngest player to represent England U21 after helping England Schools to a Grand Slam in 1995. Worsley's versatility at being able to play across the back-row won him a place in England's 1999 World Cup squad, and he subsequently made his international debut against Tonga during the tournament. He retained a place in the squad and made replacement appearances against Italy and Scotland during the 2000 Six Nations. He took Lawrence Dallaglio's place at the base of the England scrum for their 2001 summer tour of the USA and Canada, while the British and Irish Lions were in Australia. Worsley was a member of the England squad that won the Rugby World Cup in 2003, winning caps against South Africa, Samoa and Uruguay during the tournament. He became an automatic selection following the retirement of Dallaglio in 2004, and won the Premiership and Heineken Cup with Wasps that year. He made his third World Cup in 2007, making five appearances including a replacement bow in the final loss to South Africa. He toured New Zealand with England in the summer of 2008 before winning a call-up into their squad for the 2009 Six Nations. He was selected for the 2009 Lions tour of South Africa and missed the first two Test defeats but started the third Test victory in Johannesburg. The 2009-10 season proved to be a frustrating campaign for the flanker as he suffered a serious injury against New Zealand in November 2009. He returned to the England fold and played three matches in the 2010 Six Nations but by the following year he had slipped out of the international reckoning. He made what would be his last international appearance as a replacement against Wales in the 2011 Six Nations opener before a neck injury blighted the rest of his season. He battled back to fitness and claimed a spot in England's World Cup training camp but missed out on selection for the tournament itself. The neck injury would eventually end his career with Worsley admitting defeat in his fitness battle and hanging up his boots in November 2011.